ohhh…kinda like the tan handled one as well. I would like to check this out, but I’m gonna have to save up some money first. That clip does seem to be odd. Looks like it has been bent by use already. Nice review, Dan. This is the first time I’ve seen the Adamas. Ooooh, that’s a dandy! Depending on what you’re using it for, perhaps a tad too heavy is preferable to a tad too light?? Maybe not EDC-speaking but good to know you’re packing a serious piece of steel if you’re somewhere where your life could depend upon it. I don’t own any D2 blades so this one is definitely going to the top of my “wish list”. I do own a few Benchmades and they are among my favorites, can’t beat those Benchmade axis locks IMO. They really do make one hell of a fine knife. Plus it’s a one hander, LOL! $135 seems like a very decent price for a knife of that quality. It’s encouraging to see how the major knife makers are using better and better steel in (relatively) affordable, high-quality blades. A few years ago I had my eye on a different Benchmade D2 blade (cannot recall the model but it was a HUGE folder) but the price was a trifle high for my blood. Earl, I think a little extra weight can be preferable in some instances. For example, if you want to use this knife to chop, and perhaps around a campsite. I also think something should be said for how rugged this knife is. It is extremely overbuilt. But I don’t want to give people the impression that this one will ride as comfortably as a Delica or something – because it wont. I know weight is a big concern for a lot of people so I just wanted to make that point clear. GAAAAAAAAAAAAAAAAAH! Dan, why didn’t you tell me you got one! Darn it! Wow what a handful ! Got to handle one today at Bradlees Military Supply in Northern NY. It is one heck of a handful. A bit too large for my hand but one beefy folder that should hold up to pretty much anything coming its’ way. Wound up with a BM 580 Barrage, clip point…perfect size for my hand and a stout knife. Mike, Yeah man, I was not joking! The 275 is definitely a big knife. It’s a tough knife for those that need a “no compromises” tool, but imo it is not terribly practical for EDC or daily use. The 580 is a great knife, awesome choice. Like you said, plenty strong without being too much knife. The OLD saying says ” any folding knife is just a knife that is ‘broken’ in the middle… Well modern scientific engineering and metallurgy have “almost” made that saying ‘obsolete’. 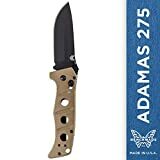 The BenchMade Adamas 275 folding knife is probably to heavy for EDC for 90% of people, but this “overbuilt” knife COULD ideally serve as a primary ‘survival’ knife. Survival knifes are your ‘one tool’ to “bet your life on” and while a folding knife can ‘never’ be as strong as a fixed blade, most true fixed blades are the same weight as this folder’s 8 ounces. Plus you get the convenience of a folding blade which is exactly a ‘built in’ “sheath”. So if space or weight are an issue this knife is a great idea, yes it is expensive; but so is any quality item. The D2 steel is not as anti corrosion as other steels but simply any quality tool takes maintenance and this is only a stropping of the edge and oiling the blade; any procrastinator should be able to manage that !! !